/ Is Bottled Water Australia’s New Favourite Drink? While major soft drink companies continue to battle declining carbonated soft drink sales, another segment continues to grow volume sales, and is now expected to overtake fizzy soft drinks as the most consumed beverage worldwide this year. This beverage is none other than bottled water. Some consider it a dazzling marketing achievement, others consider it an outrage: selling bottled water to consumers when there is perfectly good tap water to be had for free. However, plastic water bottles do generate an enormous amount of waste that is ending up in landfill or even worse in our environment. According to the 2010 Clean Up Australia Rubbish Report, one in ten items found on Clean Up Australia Day where related to plastic drinking bottles. By avoiding bottled water and refilling your own bottle you can help conserve virgin resources and protect our pristine nature. Another great side effect is saving money. One bottle of water can cost you around $2.50 versus only a few cents per litre for tap water. Having said that bottled water is poised to become the king of beverages in the United States. Despite the fact that more than a dozen colleges have banned sale of bottled water at campus dining facilities, that sales of bottled water are banned at 22 U.S. national parks—including the Grand Canyon and Zion—and that half a dozen cities have banned use of official funds to purchase bottled water, sales in 2015 hit an all-time high. 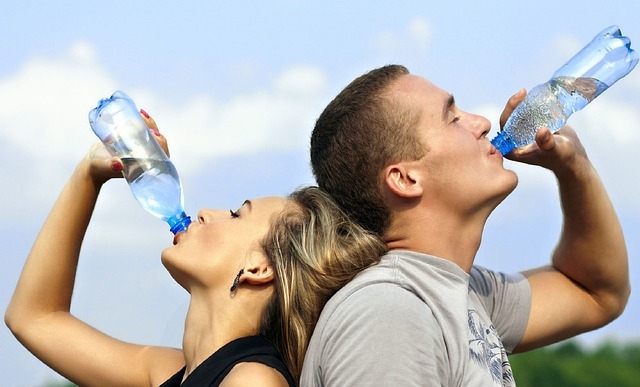 Whatever the case, there is no denying that bottled water is a bona fide hit in Australia, as the latest findings from Roy Morgan Research reveal. In 2015, some 5.3 million people (or 27.1% of Aussies 14+) drank bottled water in any given seven days — an increase on 2014, when 4.9 million Australians drank it in the same period. The most popular water brand by far is Mount Franklin, consumed by nearly 40% of all bottled-water drinkers in an average seven days. 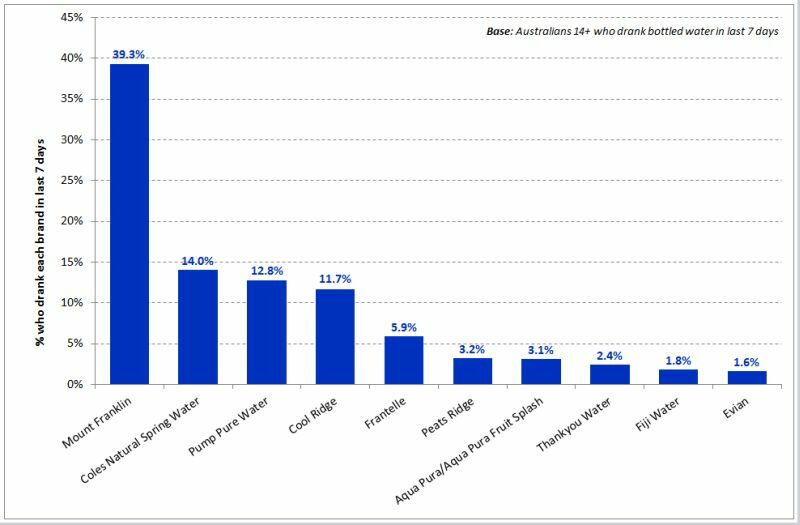 Coles Natural Spring Water is a very distant second (14.0%), just ahead of Pump Pure Water (12.8%). Despite its fame for being used by supermodels and Hollywood actresses to wash their hair, Evian is only the tenth-most popular bottled water in Australia, consumed by 1.6% of the population in an average seven days. Overall, a greater proportion of Australian women (29.7%) than men (24.5%) drink bottled water in an average seven days, and this pattern is evident across most of the top 10 brands. Cool Ridge and Fiji Water have the most pronounced gender skew towards women, while only Peats Ridge is consumed by slightly more men than women. Australians under 50 are markedly more likely than older Aussies to drink bottled water, with its popularity peaking among the 25-34 year-old bracket (a third of whom drink it in an average week). Around the country, bottled water consumption is most widespread in Western Australia, where 30.2% of residents drink it in an average seven days. NSW is close behind (29.0%), whereas Tasmanians are below average at 22.3%. “A theme emerges pretty quickly when we look at Australia’s 10 most widely consumed bottled waters: brand names that evoke images of nature (Mount Franklin, Cool Ridge, Peats Ridge, Fiji Water) or purity (Aqua Pura, Coles Natural Spring Water). Selling something we can drink for free from the tap is a big ask, but by emphasising the natural and untouched quality of their water, these brands are implying (without stating outright) that they are better for the consumer than tap water. “This message appears to be resonating with more women than men: not only do they drink more of it, as explained above, but slightly more of them (2.2 million women vs 2 million men) agree that ‘bottled water is better to drink than tap water’. Mind you, Cool Ridge’s particular success with women (who comprise 64% of all Cool Ridge drinkers) may also have something to do with its ultra-cute advertising campaign featuring puppets of native fauna brainstorming ideas to market their brand!